Using both the Business Canvas and Product Canvas, you can distinguish the ideas that are directly related to your market vs. related to your product. Both types of ideas can be tested through Discovery tasks (research and experiments) and are backed up by Evidence. We've separated your Business Ideas from your Product Ideas. 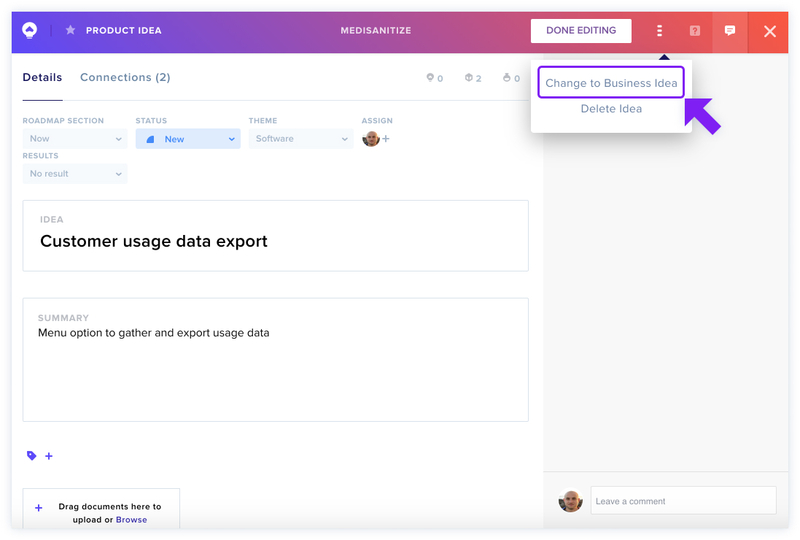 You can toggle between Business and Product Canvases in the Ideas workspace. All Ideas can be connected to the same data, such as Evidence, Research, and Experiments, as well as to other ideas, but are displayed separately. Your Business Ideas will relate to your business model, such as the value you're delivering, your target customers, and so on. Product Ideas relate to features you're shipping and what you're building next in your Roadmap, etc. Result - have you validated or invalidated this Idea? You can connect your Ideas to show correlations across data. Click into the idea, and select the Connections tab at the top. Select the tab for the type of connection you'd like to make (such as Ideas), and click the Connections Icon. Select all ideas you want to connect, and click X to save and close. If you create an Idea in your Product Canvas and realize it fits better in your Business Canvas, you can switch the Idea type! Just click the ... more icon in the top navigation bar of the idea and select Change to [Business or Product] Idea. Some features that don't overlap (such as noting the theme of the Product Idea) may be lost in the conversion. While the Product Canvas defaults to List View, you can change to the Kanban view depending on your preferences. You can further customize your Canvas Settings. This can be done by clicking the ... icon next to the column title and selecting Customize Settings. Another way to reach the settings view is to click your Profile Icon in the top right corner and select Team Settings from the menu that appears. 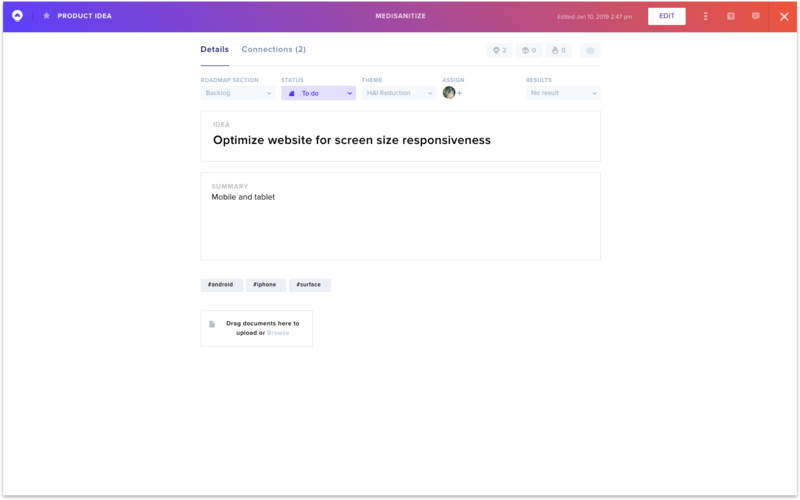 Here, you can choose to customize either the Product Ideas or Business Ideas, including Roadmap, Status, Theme, and Prioritization Score. Drag to reorder column titles, add or remove columns, and click to change the color for statuses. To learn more about using Kanban View, click here.